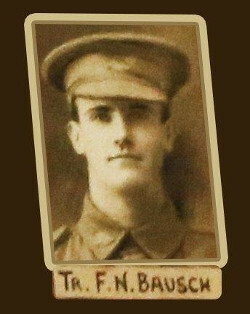 Frederick William Bausch returned to Australia on the 3rdJuly 1919. Discharged on the 25thOctober 1919. On the 18thDecember 1920 Frederick married Hazel Jessie Louise Williams. In 1924 Frederick and Hazel moved to Mologa near Bendigo, Victoria. Died on the 25thApril 1975 at Bendigo, Victoria. Buried on the 28thApril 1975 at Bendigo Lawn Cemetery.